Net Weight: Packet (340 seeds)1/4oz (11250 seeds)(+$7)1oz (45000 seeds)(+$ 20)1/4lb (180000 seeds)(+$72) This item is currently out of stock! This is the most widely grown of all the types used for drying. 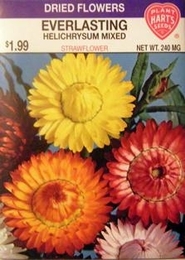 Helichrysums are an ornament in the garden when growing because of their wide range of brilliant colors. Everlasting Helichrysum flowers for drying should be gathered when partially unfolded and hung by the stems head downward in a cool dry place. Planting time - Spring to mid-summer. Thinning - when plants are 2-3 inches tall thin to 12 inches apart.